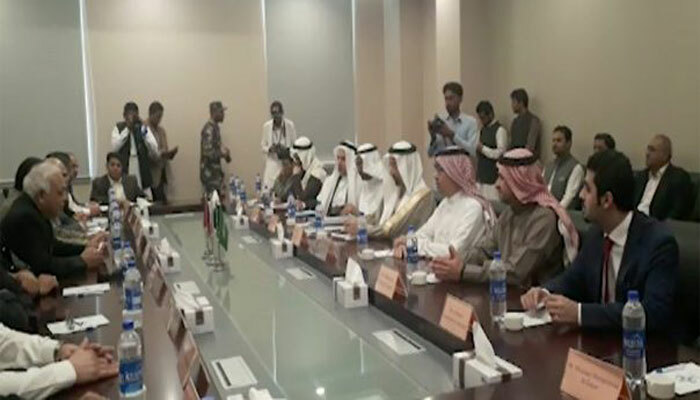 GWADAR: Saudi Minister of Energy and Industry, Prince Engineer Khalid Abdul Aziz Al-Falih on Saturday said Saudi Arabia would make historic investment in Pakistan. Mutual cooperation of Pakistan, China and Saudi Arabia on Gwadar Port, which was located in an important region, would be exemplary, he said during a meeting here with Minister for Petroleum Ghulam Sarwar Khan and Minister for Maritime Affairs Syed Ali Haider Zaidi. During the meeting, both sides reviewed possibilities of expanding exports and discussed the prospects of active cooperation to realize the existing potential of the Gwadar Port. The two sides also discussed possibilities of financial cooperation to enable Pakistan exploit energy, sanitation and mineral resources judiciously. Earlier on his arrival in Pakistan, the Saudi minister along with his delegation was received by ministers Ghulam Sarwar Khan and Syed Ali Haider Zaidi at Gwadar Airport. Deputy Ambassador of Saudi Arabia in Pakistan Habibullah Bukhari was present on the occasion. The visiting dignitary was given a briefing by GPA Chairman Dosteen Khan and GDA Director General Dr Sajjad Baloch about the Gwadar Port and the development projects at the China Complex. It may be added that the objective of the Saudi minister's visit is to finalize the proposed agreements and modalities to implement and enhance the cooperation between the two states in the fields of oil refining, petrochemical, mining and renewable energy in Pakistan.